Hotstar Watch n Play is back. Watch the IPL matches at Hotstar app regularly and participate in Watch and Play contest and win various vouchers/coupons like Amazon, BMS, 1mg and many more. Participate and start winning !! 5). Give The Right Answer To Questions, it needs 4-5 correct Answer to complete Level 1. 4) Under the Offer, any person who participates in and is declared a winner (“Game Winner”) of the ‘Watch-N-Play’ game (“Game”) conducted by Novi Digital Entertainment Private Limited (“Hotstar”) on the mobile application, namely Hotstar(“Hotstar.com”), will be able to clip a coupon (“Coupon”) from Hotstar.com. A customer who participates in and is declared a winner of the ‘Watch-N-Play’ game on Hotstar, will get an offer entitling him / her to a flat cashback of INR 100 for an order placed on BookMyShow subsequent to receipt of such offer, provided: (a) the minimum value of such order is INR 300, and (b) such customer pays for such order using the payment option “Amazon Pay” on BookMyShow. A. A customer who participates in and is declared a winner of the ‘Watch-N-Play’ game on Hotstar, will get an offer entitling him / her to a 10% cashback upto INR 100 for an order placed on 1Mg subsequent to receipt of such offer, provided: (a) the minimum value of such order is INR 500, and (b) such customer pays for such order using the payment option “Amazon Pay” on 1Mg. By availing the offer and / or the cashback, the customers agree to the terms and conditions of the promotion posted below. A customer who participates in and is declared a winner of the ‘Watch-N-Play’ game on Hotstar, will get an offer entitling him / her to a flat cashback of INR 800 for an order placed on MakeMyTrip domestic flights category subsequent to receipt of such offer, provided: (a) the minimum value of such order is INR 8000, (b) A domestic return flight ticket is booked, © Applies the code MMTAMAZONDF on MakeMyTrip and (d) such customer pays for such order using the payment option “Amazon Pay” on MakeMyTrip. A. A customer who participates in and is declared a winner of the ‘Watch-N-Play’ game on Hotstar, will get an offer entitling him / her to a 25% cashback upto IN 1000 for an order placed on MakeMyTrip domestic hotels category subsequent to receipt of such offer, provided: (a) A domestic hotel is booked, (b) Applies the code MMTAMAZONDH on MakeMyTrip and © such customer pays for such order using the payment option “Amazon Pay” on MakeMyTrip. By availing the offer and / or the cashback, the customers agree to the terms and conditions of the promotion posted below. A customer who participates in and is declared a winner of the ‘Watch-N-Play’ game on Hotstar, will get an offer entitling him / her to a 30% cashback upto INR 125 for an order placed on Faasos subsequent to receipt of such offer, provided: (a) the minimum value of such order is INR 199, and (b) such customer pays for such order using the payment option “Amazon Pay” on Faasos. By availing the offer and / or the cashback, the customers agree to the terms and conditions of the promotion posted below. A. A customer who participates in and is declared a winner of the ‘Watch-N-Play’ game on Hotstar, will get an offer entitling him / her to a 20% cashback upto INR 90 for an order placed on Behrouz Biryani subsequent to receipt of such offer, provided: (a) the minimum value of such order is INR 299, and (b) such customer pays for such order using the payment option “Amazon Pay” on Behrouz Biryani. By availing the offer and / or the cashback, the customers agree to the terms and conditions of the promotion posted on below. A. Customer who participates in and is declared a winner of the ‘Watch-N-Play’ game on Hotstar, will get an offer entitling him / her to 25% cashback upto INR 75 for an order placed on Box8 subsequent to receipt of such offer, provided: (a) such customer pays for such order using the payment option “Amazon Pay” on Box8. By availing the offer and / or the cashback, the customers agree to the terms and conditions of the promotion posted below. A. Customer who participates in and is declared a winner of the ‘Watch-N-Play’ game on Hotstar, will get an offer entitling him / her to 25% cashback upto INR 75 for an order placed on MojoPizza subsequent to receipt of such offer, provided: (a) such customer pays for such order using the payment option “Amazon Pay” on MojoPizza. By availing the offer and / or the cashback, the customers agree to the terms and conditions of the promotion posted below. A. A customer who participates in and is declared a winner of the ‘Watch-N-Play’ game on Hotstar, will get an offer entitling him / her to a cashback of 40% up to Rs.100 for an order placed on Eazydiner subsequent to receipt of such offer, provided: (a) such customer pays for such order using the payment option “Amazon Pay” on Eazydiner. By availing the offer and / or the cashback, the customers agree to the terms and conditions of the promotion posted below. 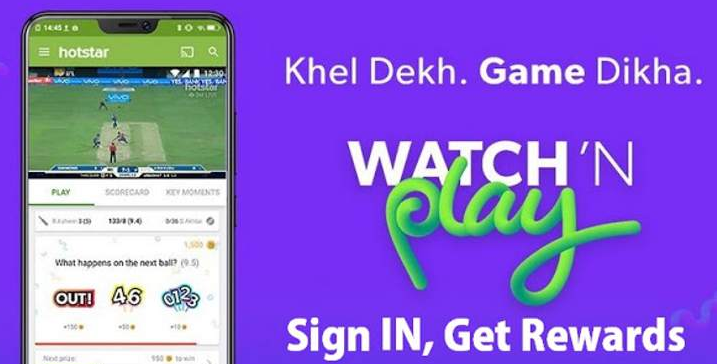 A customer who participates in and is declared a winner of the ‘Watch-N-Play’ game on Hotstar, will get an offer entitling him / her to a flat cashback of 10% for an order placed on any recharge/bill payment (Prepaid recharge, postpaid bill payment, Electricity bill payment, DTH recharge, Landline/Broadband or piped gas bill payment) across available operators or bill payment providers on Amazon, subject to a maximum of Rs.50. By availing the offer and / or the cashback, the customers agree to the terms and conditions of the promotion. A. customer who participates in and is declared a winner of the ‘Watch-N-Play’ game on Hotstar, will get an offer entitling him / her to a flat cashback of flat INR 25 for an order placed on any DTH recharge across available operators on Amazon, provided the minimum value of such order is INR 150. By availing the offer and / or the cashback, the customers agree to the terms and conditions of the promotion. A. customer who participates in and is declared a winner of the ‘Watch-N-Play’ game on Hotstar, will get an offer entitling him / her to a flat cashback of flat INR 50 for an order placed on any electricity bill payment across available operators on Amazon, provided the minimum value of such order is INR 500. By availing the offer and / or the cashback, the customers agree to the terms and conditions of the promotion. A customer who participates in and is declared a winner of the ‘Watch-N-Play’ game on Hotstar, will get an offer entitling him / her to a flat cashback of flat INR 20 for an order placed on any prepaid mobile recharge across available operators on Amazon, provided the minimum value of such order is INR 75. By availing the offer and / or the cashback, the customers agree to the terms and conditions of the promotion.